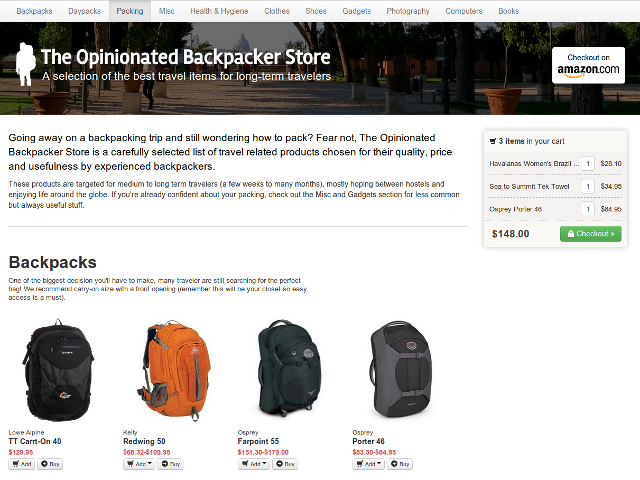 Today I’m happy to launch The Opinionated Backpacker Store. This little project started with the desire to create a well designed, easy to use and ad-free website where you could buy recommended stuff you need to travel long-term. Amazon is great to buy whatever you want but it can be tedious to select the best products. I know by experience as I spent hours searching for what to buy. This store has a limited number of products but all where carefully chosen. To keep things simple on my end, this is not a real e-commerce website. It’s merely a fronstore to Amazon. Thus, all products are listed on Amazon and the checkout process will take you to Amazon. You won’t have to worry about security, Amazon is handling everything! The Opinionated Backpacker Store is located at http://opinionatedbackpackerstore.com. By the way, as you may have noticed, I have made some small changes to the blog so it’s easier to navigate around!